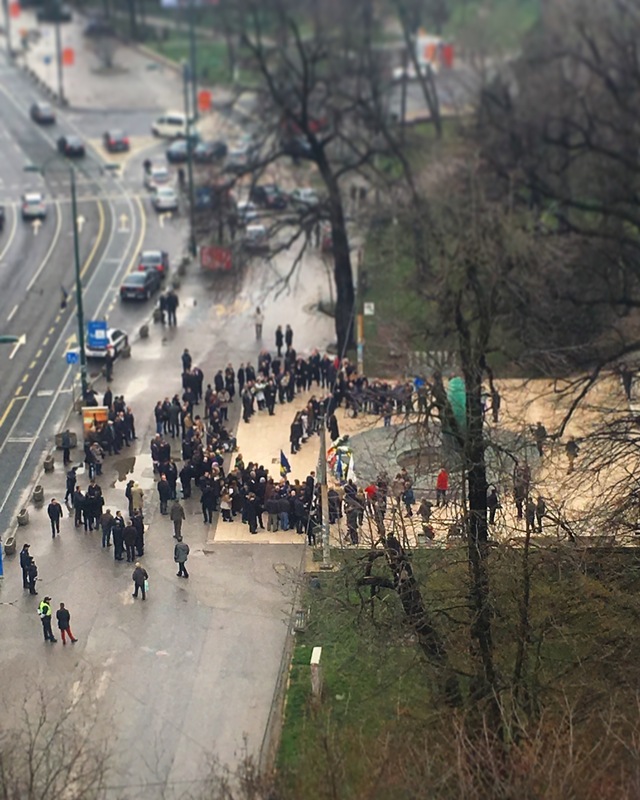 Looking down from my window today, I saw people gathering in Veliki Park at the monument dedicated to the children who had died during the Siege of Sarajevo. When I think of Independence Day, being American, I think of America’s 4th of July when we declared ourselves a new nation, independent of The British Empire. I conjure up images of spectacular fireworks, people waving the flag of their country, parades and jubilant celebrations. Alas, this is not the scene in Sarajevo. Bosniak and Bosnian Croat voters supported the referendum, while Serbs largely boycotted it. Some sources cite that Serbs in some cases boycotted the vote or were prevented from voting by Bosnian Serb authorities. In the end, an absolute majority of the voting-age population of Yugoslav Bosnian Socialist Republic voted for the independence of Bosnia and Herzegovina. The total turnout of voters was 63.6% of which 99.7% voted for the independence of Bosnia and Herzegovina. (wikipedia) Despite the fact that the European community supported and recognised this decision, the political representatives of Bosnian Serbians rejected it, thus leading to the initiation of the Bosnian War. It was not until March 1, 1995, three years later, (and still in the midst of conflict) Independence Day was celebrated for the first time. The Bosnian War would not end until 8 months later, when the Dayton Accord was signed on November 21, 1995. It should be noted that the Serbians of Bosnia and Herzegovina or the Republika Srpska (Serb Republic) boycott this holiday and celebrates its own Independence Day on the 9th of January. So many lives were lost, especially in the city of Sarajevo. It is no surprise that the day intended to celebrate the independence of their country also commemorates the many lives lost who fought for that independence, including the 521 innocent children of Sarajevo who would never live to see this day. During our first walk of many through Old Town Sarajevo we visited a beautiful place, the Gazi Husrev-beg Mosque. This is a bustling meeting place in Old Town and most days we see folks gathering here to socialise before and after prayer time. Our group arrived before the afternoon prayer, with just enough time to tour the inside of the mosque. Even though this was my first time in a mosque I knew the expectation was for everyone to remove their shoes, and that female visitors cover their heads with a scarf. During warmer weather, visitors are expected to wash their feet in the fountain before entering the mosque. Historical plaque outside the mosque. The main entrance of the Gazi Husrev-beg Mosque. This is the lovely fountain for feet washing. Because we were visiting in the winter, the water was not running. The ceiling of the fountain in the courtyard. This mosque was built in 1532 and stands as one of the prime examples of Ottoman Architecture in all of Bosnia and Herzegovina. In 1898, this was the first mosque in the world to receive electricity and lighting. During the siege of Sarajevo, this mosque as well as other prominent landmarks such as libraries, museums and governmental buildings were targeted by the Serbian forces. This mosque suffered so much damage from the seige that it had to be reconstructed (in 1996). Consequently, the old patterns and designs inside of the mosque were destroyed and were repainted by Bosnian calligrapher Hazim Numanagić in 2001/2002. Gazi Husrev-beg is a beautiful mosque that has withstood the test of time, as well as war. Destination: Sarajevo. We left our small town in Wisconsin for our next adventure on January 5th and again, like most of our experiences, it was 24 hours of travel from door to door. This was by far the most surreal way to arrive in a city. Do you know how it feels when you’ve been awake for about 20 hours and you’re almost at your destination, but you’re not quite there yet? Must. Stay. Awake. I was tired and groggy, a bit foggy to say the least. I was fighting to stay awake, to get a peek at the city from above. I’m always excited to get an aerial view of our new host city. But alas, when I looked out my tiny airplane window I saw only mountains rising out of the mist, Sarajevo shrouded and hidden, mysterious, waiting to reveal herself to our family. Under the dense fog we discovered a city covered with fresh snow. According to my taxi driver, the city had been under this dense fog for 28 days in a row. The snow was beautiful, and the fog definitely added to the city’s enigmatic and eerie feeling. Driving away from the airport, I caught my first glimpse of the bullet ridden buildings staring at me, the scars left behind from a war fought only 20 years ago. I couldn’t help but comment to my driver about the bullet holes. These scars are everywhere and it was shocking to me. He told me I would see this all over the city. He told me he was eight years old during the Siege of Sarajevo. He lived 500 meters from the Town Hall at the end of Old Town. When the Town Hall was blasted and set on fire, he remembers “papers flying and floating through the air everywhere. The papers were this high all through the streets around there,” motioning to his waist. “They destroyed our library, all our important documents were erased.” This was a prelude to many stories we would eventually hear. I always remember the arrival to our new home in each country we visit. Whether we are arriving on a rainy day, in a cloudy mist on a mountainside, or blinking back the bright sun and heat. On this particular day, we arrived in heavy, wet snow on a crowded city street. The taxi drivers could not get us close to our door, so both drivers helped us pull all our luggage down one block, across the busy city street and up to our ninth floor apartment. Our apartment is one of the highlights of living in Sarajevo. We are close to the center of the city and only blocks away from Sarajevo’s charming Old Town. Our grocery store is right across the street as well as one of the best Pie Shops around. Cafés are everywhere and we can walk out the door and hail a cab within seconds. Convenience and charm are beneficial, however, the close proximity of the hills facing the front and back sides of our building is actually quite startling. I wake up every day and look at those hills and I can’t help but wonder what it would have been like to live in a city that was under direct fire from snipers hiding in those houses on a daily basis, a siege that lasted three years. Sarajevo, what lessons will you teach us about war, about how this city was rebuilt and how a country’s citizens and government mend relationships?